For many of us a luxury holiday is something we may only do once or twice every decade, and rightly so. Flights, hotels and other expenses can soon add up to a staggering amount, so while it’s nice to splash out one a little luxury, it’s important to make the right choices in regards to destination and accommodation. Luxury hotels are an amazing place to spend a few days of the year and the facilities on offer by many luxury hotels are amazing. Their plan is to encourage clients to use the facilities in the hotel to maximise their profits, and there is absolutely nothing wrong with that. One of the larger, more luxurious facilities offered by many hotels is the spa and pool area. A place where guests are encouraged to be pampered, relax, unwind and leave feeling refreshed. Today hotels need something a bit more special than just a standard pool and guests expect swimming pools to be something of a spectacle in the expensive and luxurious hotels throughout the world. So with the stakes raised and hotels spending massive amount of money on fantastic facilities, here is me list of some of the world best. 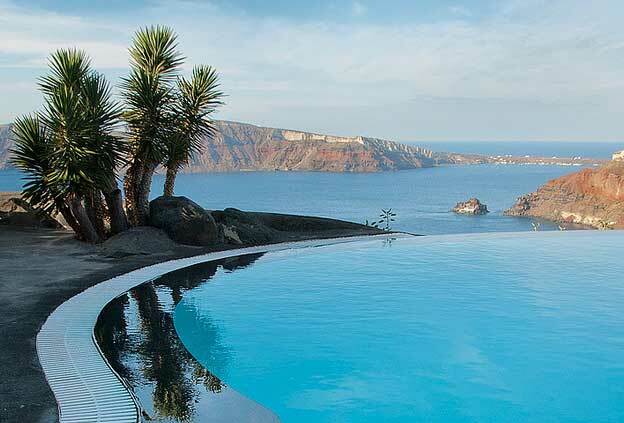 The magnificent infinity pool at the Perivolas in Greece is perhaps one of the most photographed pools in the world. Looking out over the Aegean this lipless pool offers some staggering views throughout the day and especially into the evening. The swimming pool forms the central part of the hotel and is its main selling point offering views across the bay where many cruise ships moor to take advantage of one of the most spectacular sunsets in the world. The swimming pool at the Fullerton Hotel in Singapore is not particularly long, wide or deep. 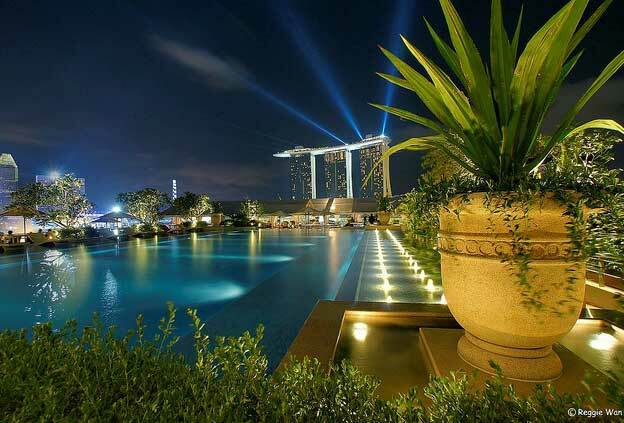 But the views from this infinity pool as you swim among the Singapore skyscrapers is truly breathtaking. 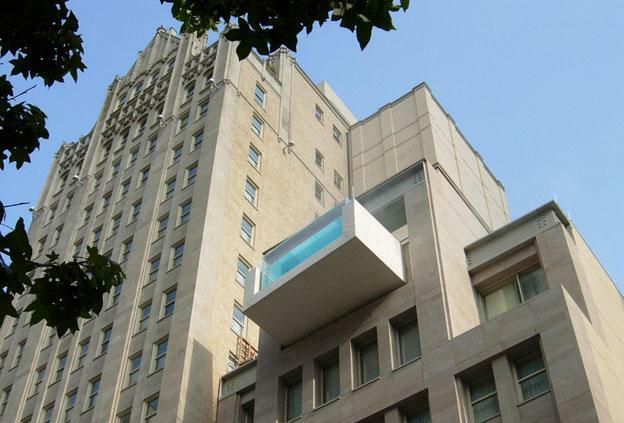 The swimming pool at The Joule Hotel in Dallas, America is something of an engineering marvel. Overhanging the streets below by 8 feet on the 10th floor, this infinity pool, engineered by ARCHITEXAS, offer guests an amazing swimming experience and offers fantastic views of Downtown Dallas. The world’s largest swimming pool had to make this list. Measuring 1,013 meters in length, this staggering pool covers 8 hectares of land, contains 250,000 cubic meters of sea water and up to 35 meters deep in places. 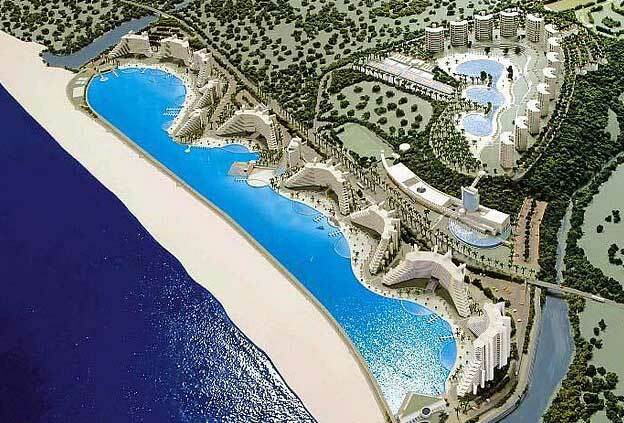 The pool uses sea water that is pumped, filtered and treated from the Pacific Ocean and is navigable by small boats. This 6 star hotel offers luxury to the extreme and the infinity pool is no different. 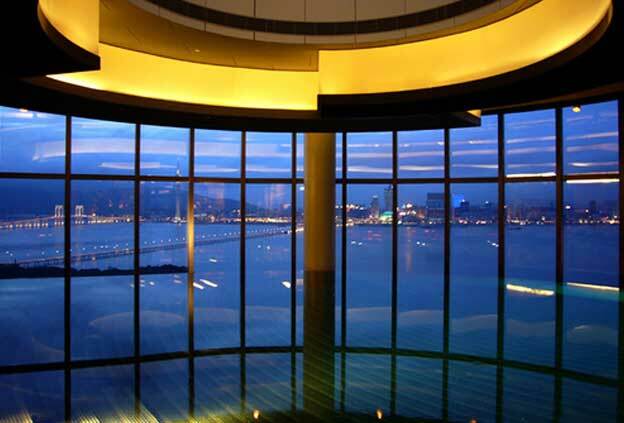 The floor to ceiling windows following the profile of the building and offers fantastic views of the Macau harbour. Alex is a freelance internet marketer and copywriter working a company that specialises in swimming pools. You can find him on Twitter here @ harvey1dash8.